"I would like pay tribute to my teammates and the Almighty. I could not have done it alone," said Chinyengetere. Mapeza also wrote his own piece of history after being crowned coach of the year for winning his third PSL title, his second in a row with FC Platinum having won his first with Monomotapa FC. "It was all down to hard work, it was not easy but am glad we achieved it in the end," said Mapeza. FC Platinum defender Kevin Moyo was second runner up finishing among the top three for the second year having being named first runner last year. Former Triangle midfielder Lameck Nhamo's hard work paid off by being named soccer of the year first runner up after helping the "Sugar Sugar Boys" to a top four finish and clinching the Chibuku trophy. "I am really pleased to have been recognised. It was not easy especially playing for a club like Triangle. I look forward to even bigger challenges in the coming year," noted Nhamo. 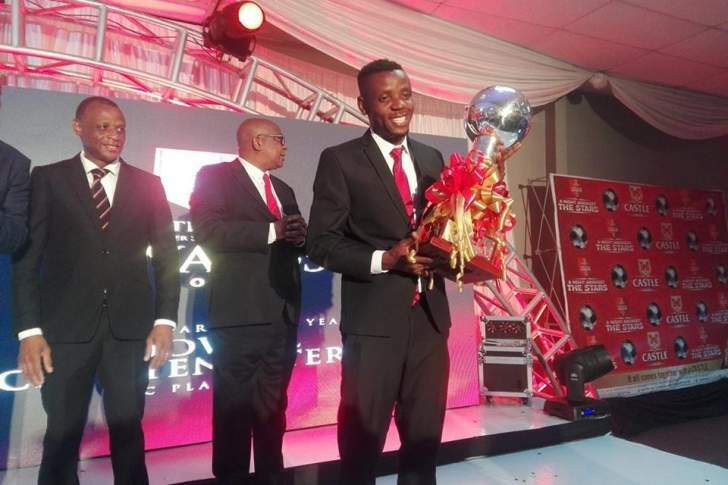 Highlanders' Ariel Sibanda whose clean sheets and penalty saves earned him the crown of the goalkeeper of the year while Harare City's Tatenda Tumba was named the rookie-of-the-year. Top referees Ruzive Ruzive and Norman Matemera were named joint winners for the match officials of the year while Tafadzwa Nkala and Luckson Mhara were runners-up. The castle soccer stars of the year were selected last Thursday in the capital by a panel of journalists, coaches and captains of clubs. The prestigious awards have been running since inauguration in 1969. Legendary George Shaya holds the record of five awards followed by the late Stanley Ndunduma and legend Peter Ndlovu. Chinyengetere becomes the latest player to join the elite club of players to have won the award more than once.